AUSTIN, Texas (March 22, 2018) – Lone Star Racing will compete in the opening rounds of the 2018 Pirelli World Challenge SprintX Championship in the No. 80 ACS Manufacturing/Lone Star Racing Mercedes-AMG GT3 with the new driver pairing of Mike Skeen and Scott Heckert. The SprintX races, this weekend at Circuit of The Americas (COTA) and next month at VIRginia International Raceway (VIR), are the first announced events in Lone Star Racing’s select schedule of planned races in 2018. 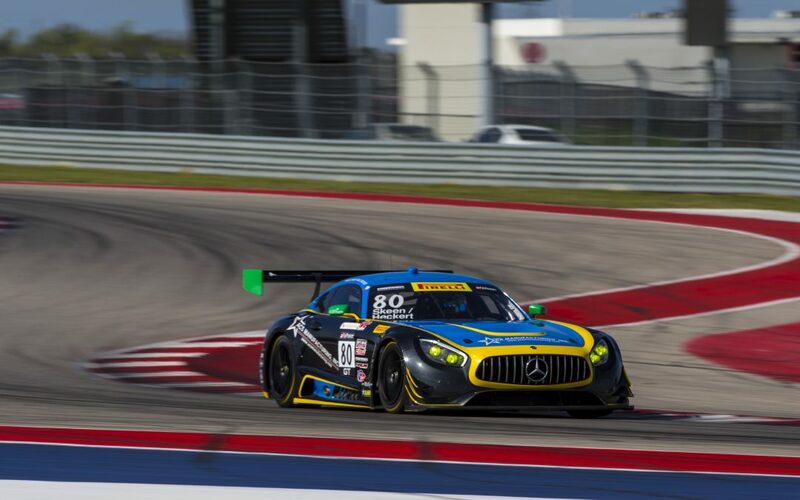 Top GT driver Skeen begins his third year with Lone Star Racing while Heckert, a former Pirelli World Challenge race winner who competed in 2017 in a Mercedes-AMG GT3 in Europe, will fill-in for Lone Star Racing team owner and driver Dan Knox at COTA and VIR. The COTA race will be the first time Lone Star Racing has ever competed without Knox as a driver. Skeen has raced with Lone Star at COTA each of the last two years and, along with fellow Charlotte-area resident Heckert, will return with the team to his home track of VIR next month for the third time. With VIR located right on the Northern border of North Carolina just over the Virginia state line, many Charlotte-area residents consider VIR a home track. Lone Star is stepping up to the top-tier SprintX GT Pro/Pro class for the COTA and VIR races. Heckert co-drove in the Blancpain Endurance Series in Europe last season in a Mercedes-AMG GT3 prepared by the premier Black Falcon team. Skeen also competed in a Mercedes-AMG GT3 in a pair of 2017 Blancpain Endurance races, in addition to four events in Lone Star’s No. 80 ACS Manufacturing Mercedes-AMG GT3. Lone Star’s two-race start to its select schedule of 2018 events in multiple series is a deliberate plan they have followed the last two seasons, with additional races expected to be added in the near future. This weekend’s COTA schedule includes unofficial testing today, Thursday, March 22, and official practice on Friday, March 23. Saturday, March 24, starts with SprintX GT qualifying in the morning and the first of the weekend’s two races that afternoon at 3:45 p.m. CDT. Sunday’s second and final one-hour race is scheduled to start at 2:10 p.m. CDT.